La Paz golf course in Bolivia (extreme golf courses in the world) has led me on to investigate Mount Illimani – the highest mountain in the Cordillera Real (part of the Cordillera Oriental, a subrange of the Andes). 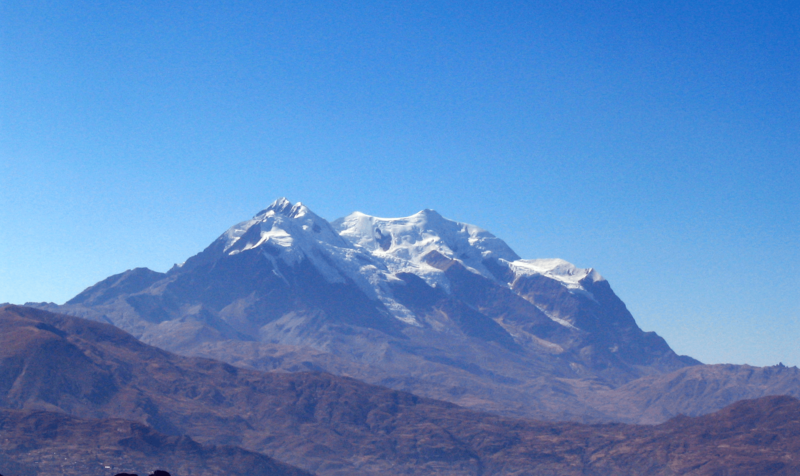 It is the second highest peak in Bolivia, after Nevado Sajama, and the eighteenth highest peak in South America. The name means golden eagle in the local Aimara language. The snow line lies at about 4,570 metres (15,000 ft) above sea level, and glaciers are found on the northern face at 4,983 m (16,350 ft). The mountain has four main peaks; the highest is the south summit, Nevado Illimani, which is a popular ascent for mountain climbers. Illimani was first attempted in 1877 by C. Wiener, J. de Grumkow, and J. C. Ocampo. They failed to reach the main summit, but did reach a southeastern subsummit. In 1898, British climber Sir William Martin Conway and two Swiss guides, A. Maquignaz and L. Pellissier, made the first recorded ascent of the peak, again from the southeast. (They found a piece of Aimara rope at over 6,000 m (20,000 ft), so an earlier ascent cannot be completely discounted.) The ascent took 5 days, and on the 4th day the Indian porters bolted. The party suffered great weakness during their last hour on the summit, but no actual illness. Conway described the view from the top as “astounding”. The current standard route on the mountain climbs the west ridge of the main summit. It was first climbed in 1940, by the Germans R. Boetcher, F. Fritz, and W. Kühn, and is graded French PD+/AD-. This route usually requires four days, whereas the summit is reached in the morning of the third day. The majestic heights of the Bolivian mountains is an awe-inspiring sight for even the most world weary mountaineers. Whether you’ve scaled Everest, Kilimanjaro or Kailas, the spectacular peaks of the Andes beckon you to a climb that is unlike any other you’ll ever experience. Most climbers would be wise to spend a few days acclimatising at La Paz before attempting any of the many climbs on offer. Huayana Potosi is a tempting climb and a relatively easy one to begin with. A half day’s hike from La Paz, this easily accessible peak is a must for any climber that visits Bolivia. It’s other name, Kaka-aka, means, ‘the one who came from the rocks’. You could easily spend a week or more climbing the Mount Condoriri range, comprised of 50 peaks with a range of difficulty and elevations which welcome the climber who wants to experience some extended time and camping and trekking. Visible from the capitol of La Paz, the forbidding peak of Illimani summons any hardy adventurer daring enough to scale its snow-covered face. 7 peaks make up this highest of all the mountains in the Cordillera Real, the southern peak being the tallest of all the Andes Mountains in Bolivia. A number of trails will take you to the top. You can try the straightforward ascent from the west, or challenge yourself by taking on one of the more difficult routes. Be sure to give yourself a few days to take in the climb and savor the lovely alpine setting. By the third day you will have reached the summit at a leisurely pace, where you can absorb some of the best views of the Cordillera Real from the top of Mount Illimani.